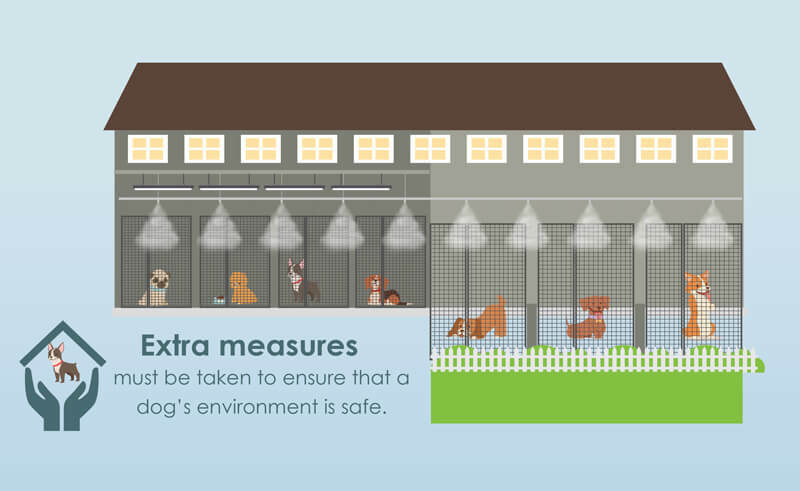 While shelters may not be concerned about the financial benefits of a misting system, for-profit kennels and “dog hotels” boast a competitive advantage by offering a cool, safe environment for dogs under their care. Most facilities seek to create a unique and unforgettable experience for dogs and owners alike. They know that pet owners want to feel like their dogs are being given star quality treatment. What better way than visibly demonstrating that their facilities have thought of everything? Marcie Campbell, owner of the Bow Wow Bungalow in Burbank, California, installed a Koolfog misting system at her facility. Self-described as one part “doggie-disneyland”, one part hotel, and one part spa, the Bow Wow Bungalo includes a vast private dog park with swimming pool, waterfall and tunnels. Marcie calls Koolfog misters “the best misters made possible” and adds that her clients absolutely love that their dogs are kept cool.